All the benefits of the Constructor wheelbarrow, but with a puncture-proof wheel. A legacy design that maintains its popularity. It was first produced in the 1970s with an innovative ‘NZ first’ seam-free and bolt-free tray that set the standard for modern wheelbarrows. Forty years later it is still NZ’s most popular steel wheelbarrow. Reliable and traditional – made to last. Even when it’s old and scratched, our tray will not rust. Powder coated with a safety yellow finish. Hot-dip galvanised components and bolts. 6mm hot-dip galvanised legs and braces. 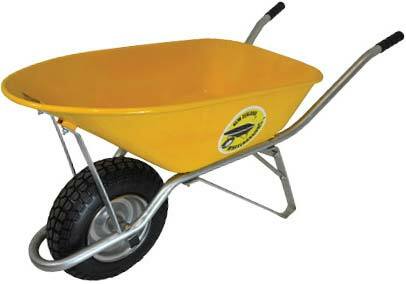 Simply put, we think this is the ultimate steel rimmed wheel for any wheelbarrow. 4 ply tyres – 16x4.80/4.00-8 tyre with a thick, block tread. Wide steel rim with rolled edge to care for the tyre over bumps and edges. The butyl rubber inner tube holds pressure longer. Large, free-running, high quality, precision sealed ball bearings. 180kg capacity puncture proof NEVER FLAT PU tyre. To purchase your spare parts please see your local retailer. "I tell you this is one tough durable proven wheelbarrow that will withstand the rigours of construction or demolition abuse with aplomb! Designed and assembled in NZ for all New Zealand's constructors"